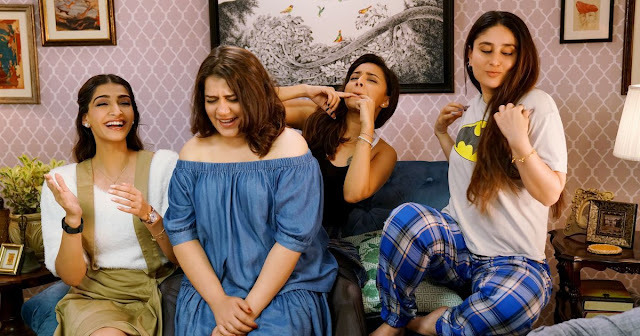 Cast:Kareena Kapoor, Sonam Kapoor, Swara Bhaskar, Shikha Talsania, Sumeet Vyas. Once upon a time, there lived a group of friends. One day, they decided to collaborate on a project that would showcase to the world their talent. Each contributed to the work in his/her own way. But once the project was complete and almost ready to be unveiled before the public, tragedy struck. One of the friends decided that she was getting a raw deal, and chose to back out. Not that this would affect the product - her work on it was done, it was just that her name wouldn’t be featured. So, the other friends went ahead and put the work on exhibition, and most of the people who saw it said that it was glorious. Critics were bowled over, the public hailed it as path-breaking, and while a few said that it made them uncomfortable, they were quickly termed ancient and standing in the way of progress. In case it isn’t clear, the product in question is Veere Di Wedding and the friends are a car company, a ride-sharing app, a matrimonial website, an ice cream brand, a bank, a jewellery company, an airline that has seen better times, an educational institution, and a snack brand. Veere Di Wedding isn’t a movie, it is a series of advertisements around which something resembling a plot has been woven, rather hurriedly and rather shoddily. Not since Yaadein (“Lo paas paas khao”) and the Krrish series (“Bournvita, Bournvita, Bournvitaaaaa”) have we been subjected to such blatant product placement in a film. Entire scenes, conversations and songs are set up so that a brand can be showcased. "Oh Bournvita, is there anything you can't do?" The plot is simple enough, four best friends with their own sets of issues and complications meet up when one of them gets married. There’s Kalindi (Kareena Kapoor) who is scared of getting married because she has seen the unhappy marriage of her parents, and oh, by the way, she is the one getting married here. Avni (Sonam Kapoor), who is being forced to get married by her mother. There’s Sakshi (Swara Bhaskar), the richest of the rich ones, she is the rebel of the gang as evidenced by her character always being depicted smoking, drinking, abusing, and wearing the least clothes. Yes, yesterday’s vamp is today’s rebel. Meera (Shikha Talsania) brings up the quartet, she is married to a firang, which is why her family has ceased all forms of communication with her. "Okay gurlzz, just act like you are having fun." The plot could have worked and we could have had a light, frothy (but enjoyable) film, but way too much time is wasted in building up camaraderie, which in turn is basically an excuse for getting the characters to say out loud or use the many products written about above. Apart from the individual struggle of the protagonists, there are also a couple of subplots involving family disputes and gay relatives (a notch below typical gay depictions in Bollywood, but still playing up the stereotypes). Of the performers, Shikha Talsania is the best of the lot while Swara Bhaskar puts up a fine performance as well (and no, she doesn’t seem out of place playing a rich girl). Sumeet Vyas is quite decent and Kareena Kapoor Khan is strictly okay. But for me, the performance that really stood out was that of Sonam Kapoor’s. In the industry for 11 years now, she is not counted amongst the better actors in spite of her winning a national award. She is, to put it mildly, terrible at acting. I would say that Katrina Kaif looks like a three-time academy award winner when compared to Sonam Kapoor. 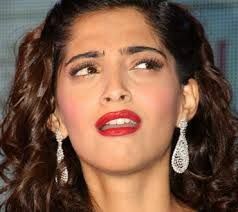 Sonam has two and a half expressions and no matter what a scene requires her to do she emotes and speaks the same way – somewhere between an 'awww' and an ‘ewwww’. Sonam Kapoor is the one who settles the nepotism debate once and for all and single-handedly makes up for the talent that other star kids possess. Thankfully, in Veere Di Wedding, it is her pathetic performance that makes up for an extremely dull second half. "That's no compliment, is it?" In films exploring the theme of friendship, it is not uncommon to have a confrontation scene which is followed by a period when the friends stop being friends. This is usually a transformative experience through which the protagonists understand the value of their friendship and often undergo a journey towards self-discovery. In Veere Di Wedding there is such a scene, post which the friends stop being friends for an onscreen duration of 54 seconds. How do they reunite? By one of them randomly proposing that they make a trip to Phuket. One airline ad later all is right with the world again. Truly, a journey towards self-discovery. Is Veere Di Wedding a progressive film? Yes, yes, it is, but only if you are the kind that feels a movie’s progressiveness quotient is directly proportional to the number of cuss words being spoken by the female protagonists. Recommended for Sonam Kapoor fans. PS. In case you’re wondering what the opening para is about, the jewellery brand is never mentioned (one friend backs out) even though there is a dedicated scene to promote jewellery. PPS. The makers missed a trick. Kareena Kapoor is shown scratching her neck whenever she is nervous or indecisive, surely there was room for an ItchGuard ad. Here's a review of another masterpiece - Sarkar 3.